It showed up to me late last week, and I have been thinking a lot about it ever since. I had a bunch of non dish washing shifts this week, so I knew it would be the time to bust out that beautiful plate and test it out. Now, after my adventure with Half n Half nails, I wasn't quite ready to give them up.. So I went with half China Glaze Lemon Fizz and half China Glaze Sweet Hook. I liked them already.. Then I had to go in with my sub-par stamping 'skillz', but, believe it or not, this has netted me the most comments by people so far this year.. I also was impatient and have some dragged areas - but, the image itself is amazing. As you can see.. via my thumb.. 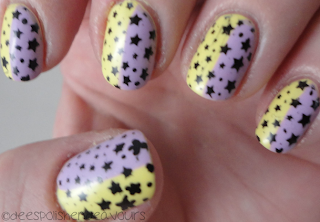 I had an area of blank space, and instead of trying to just stamp on some stars, I freehanded.. With a dotting tool. Not so pretty, but no one really seemed to notice. I love the idea of the stars.. I can see me adding this in to my next go with galaxy nails! Also, when I was first glancing at the plate when it arrived, my mom pops around my shoulder and says 'can I get you to put those bows on my fingers?' - I was like 'what bows?!' - yeah! Adorable bow on the plate as well. Geez! See? I was so enthralled with the stars that I didn't even notice the other images. The bow, some really gorgeous flowers and some hot lips. Not going to lie, I lucked out! I think it would be a really great plate to own, especially with spring right around the corner - the flower images scream spring manis with pastel colours - just saying! Product provided to me for review. Love the colours and that Konad Plate sounds interesting. i LOVE this.. i must get this plate and try this half and half thing.